Yesterday, someone crashed a $1 million Ferrari crashed into a utility pole on the Pacific Coast Highway in Malibu, California. Bel-air resident Stefan Eriksson claims that he was just a passenger in the car and that the driver, who he knew only as “Dietrich,” ran away from the scene. Apparently, investigators haven’t yet determined who owns the car either. Eriksson “had a .09 blood-alcohol level, but if he’s a passenger, that’s OK,” Brooks said. “But he had a bloody lip, and only the air bag on the driver’s side had blood on it. The passenger-side air bag did not. My Scooby-Doo detectives are looking closely into that. This reminds me of the crash we encountered while driving to Murmansk couple years ago. 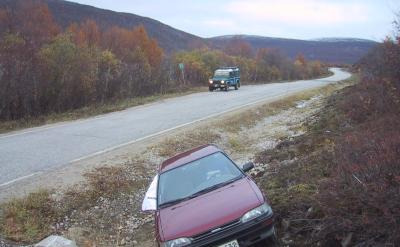 There was a crashed car on the side of the road about 8km east of Utsjoki. We of course stopped to see what was wrong. The driver’s seat was empty, and there was a quite drunken and a bit bloody old guy sitting in the passenger side. We woke him up and asked if he needed any help, to which he said yes. Then we asked about calling the police and he said that no, he didn’t need any help. He told us that he had asked some “unknown man” to drive the car for him, and that the man had disappeared right after the crash. Maybe the same “Dietrich” is to blame? We checked that there didn’t seem to be any immediate risk of anything, set out the warning triangle, and drove a bit further on the road to get cell coverage and called 112. The Utsjoki police took charge of the situation, and apparently everything ended well. I was called a bit later by the police for some questions. 16 November 2008. 4 minute read.